The Mysterious James Brennerman: Did He Exist and Where Did All his Fakes Come From? Provenance research is important to all those interested in the collecting, exhibiting, and study of art. IFAR’s enhanced Provenance Guide, a comprehensive primer on conducting provenance research, is being made available to all on IFAR’s Website, free of charge. 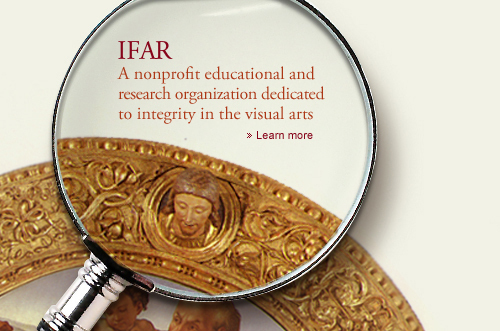 IFAR is in the News - Again!IFAR has recently exposed several major art scams, and the issues we have long been involved with have captured public attention. See some of the many articles recently written about us. Selected items from the Stolen Art Alert section of the IFAR Journal. Your IFAR membership support helps us accomplish even more. Benefits include subscription to the IFAR Journal and free admission to IFAR Evenings.